I think my faithful readers will find that little has changed since I last blogged. I'm still using a crummy little digital camera and struggling to get shots that are bright enough and in focus. I still write posts that are too long. I still try to be funny and fail a lot of the time, and I still making typing errors that make me look like I don't understand basic grammar and spelling and fail to proofread. Getting back into this blog will be nostalgic for all of us. And, I don't mean the good kind of nostalgia like opening Christmas gifts when you were a kid and it all seemed so magical and wondrous because you hadn't yet learned that the fat guy who left gifts, ate your cookies, and drank your milk was your dad (or mom). I mean the kind of nostalgia that comes from a bad Thanksgiving meal full of relatives with political views you don't share and who feel its their responsibility to convert you to either their religion or their atheism. Somehow though, you feel like you need to keep coming back anyway. 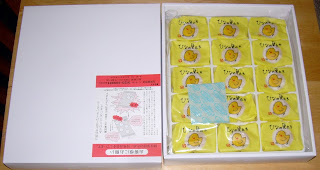 As I mentioned in my previous post, the first item I'll be reviewing is Hina no Sudachi. 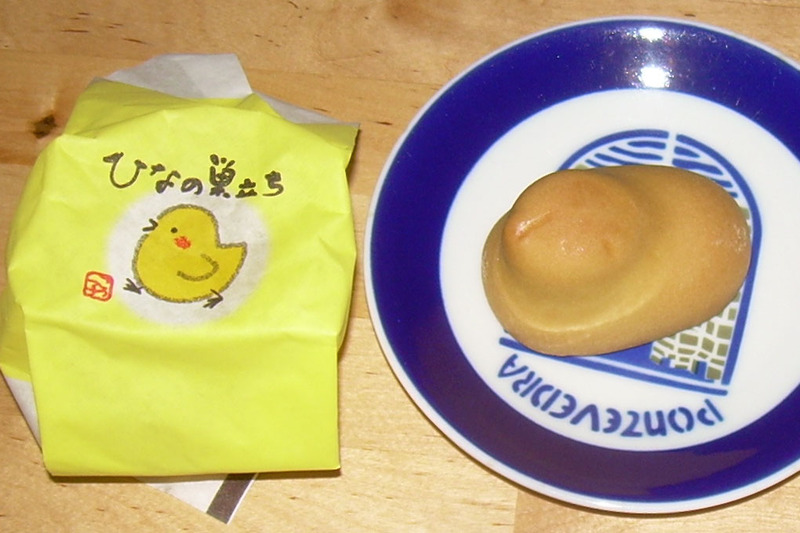 This is a "steamed bun with bean jam using egg yolk," according to the package. If the ingredients list is any indication of quantity, and in the U.S., the first ingredient is supposed to make up the largest amount, egg yolks are the top ingredient followed by white beans. Oddly, I didn't find the interior of the cake to be as yellow as I'd expect nor as yellow as the store displays show (that's a Facebook link and won't work unless you have an account - a Yelp one of lesser quality is here). That is okay because I'm less interested in the color than the taste. I will note that my husband and I both have a great fondness for this particular type of sweet. That is, we love the white bean ones with the cake-like shells and continue to reminisce about the ones we bought regularly in Japan like Kamome no Tamgo and Koganei Imo. In fact, these are the only types of Japanese sweets my husband actually likes. He may tolerate others to a limited extent, but he is happy to eat these because the bean filling is finer and not especially "beany" compared to red bean (adzuki) types. This cake didn't have a high bar to vault over though as neither of us expected it to surpass our favorites. We just expected it to be a solid white bean cake option, and, it was. The external cake was tender, but not too moist and didn't crack or crumble. When I tasted the shell alone, it seemed to have a buttery flavor (which has to be fake or my imagination). It is quite thin and separates easily from the filling if you cut the cake in half as I did. When you see the inside, it is exactly what you'd want it to be. That is, it is moist and holds together so it doesn't have the powdery, dessicated texture that some snacks do. I wouldn't recommend cutting it unless you're splitting it with someone as it's better to have an intact shell to hold the filling. If the filling falls out, it stays in a moist (but not too wet) lump so it's easy to pick up and put back in. The bean filling is sweet, though not especially so by American standards, and has a flavor which is hard define, but is still appealing. It's more of a generic "baked goods" taste, but it does seem to have a bit of what could be vanilla. The ingredients include artificial flavors as well as beta carotene (natural coloring). Though it seems a bit buttery, it contains cottonseed and soybean oil, but no cow-based fats. It was in the spectrum of what you'd find in a sweet, baked item and not the least bit beany (as expected). I will note that I wasn't sure if this product was produced only for the American market (which would be weird, but I never saw this in Japan), and I did have issues finding it online. 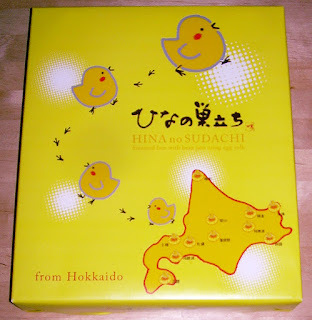 However, it is actually a product of Hokkaido and I found a blog that referenced it as part of a souvenir multi-pack. There's also a pointless 16-second video of one here. So, it's definitely sold in Japan, but my guess is that it is regional enough to not be easily found in Tokyo. As I was gearing up to do my research, as I did so often in the past, I realized that I have never used a Windows PC to write my blog posts before and had no idea how to swap to Japanese language. I'm still not sure how to use it as well as how I once did on my old Mac Mini, but I'll get used to it. I'm definitely rusty and hope to get back to my previous level of highly inadequate and pathetic Japanese input and usage rather than remain at my current level of confusion. The big question I have to ask myself is whether or not I'd buy this again. The answer is that I would, but not every single time I order from Nippon-ya. It's tasty, but it's not out-of-the-ballpark amazing. 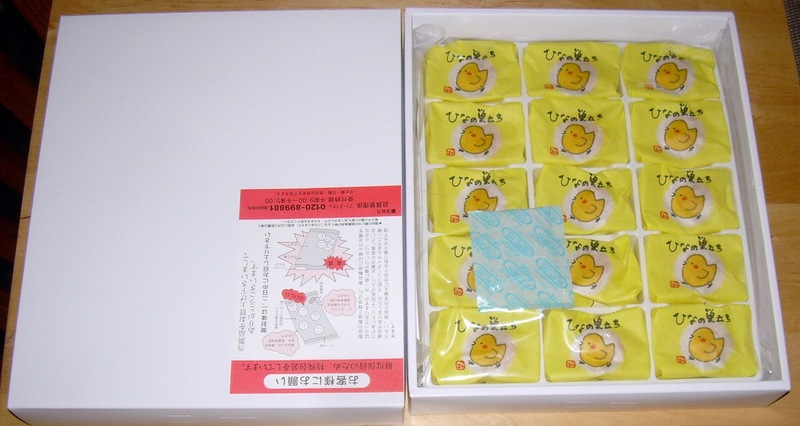 It's also the heaviest box of sweets in my current crop so there is a premium attached to buying it as opposed to trying something new so I'd be likely to order this once in awhile rather than as a staple. That's in no way saying it's not worth it, but just recognizing that this doesn't rise to the same level as our other white bean cake favorites. 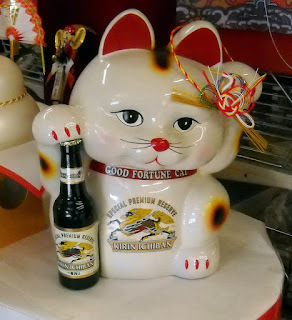 It's been two years and eight months since I walked away from my Japan blogs. I'm not sure that I am back "for good" or on nearly as consistent a basis as before, but I am sure that there are some experiences I want to share both with any of my readers who may check in from time to time and for the sake of my deeply exploring and remembering my own experiences. I continue to believe that my writing, photographing, and talking in detail helps me remember and be more present with even the smallest of experiences. Before I get to the purpose of this particular post, I'll say that my life has been very chaotic since returning to the U.S. and one of the reasons I think I'm ready to come back to writing here is that things finally settled down about a year and a half ago. I'm very poor at making long stories short. In fact, my greatest strength and weakness is at making short stories longer than necessary, but I'll try not to belabor my short history since leaving Japan. My husband and I moved seven times in the five years that we have been back in the United States. This was after having lived in Tokyo for 23 years and not having moved once. We aren't the sort of people who are comfortable with such upheaval and it was very stressful. We also found our support systems limited for a variety of reasons, not the least of which is that I have no family and few friends on the West Coast to assist in things like moving. Since I was born in the Northeast, this is no shock. What few friends I had from a brief stint of living in the Bay Area from 1988-1989 had largely moved or (sadly) passed away. During our five years back, we have not only experienced what people call "reverse culture shock," but also the sense that we'd dropped out of time for over two decades and popped back up into a new "America." While we rode the wave of change in Japan, we were oblivious to how Americans had changed, and boy howdy, had they changed. What is more, it was not pretty from our perspective. This difficulty was coupled with the loss of our Japanese working life and a great deal of economic upheaval which left investing in such trivialities as Japanese snacks a very stressful endeavor. I rarely made enough money from blogging to cover the cost of my snacks in Japan, and they are greatly more expensive here in the U.S. Buying such things only compounded my sense that we were blowing our hard-earned savings to no economic advantage and I found it hard to enjoy the expeiences. Fortunately, my husband's career change is now complete and our situation is stabilized. I am now in a position to indulge a bit and consider finding new avenues to access an old love - Japanese food. I also feel that I'm now in a similar position to a lot of my readers in this regard as many of them have no access to local shops for Japanese food either. 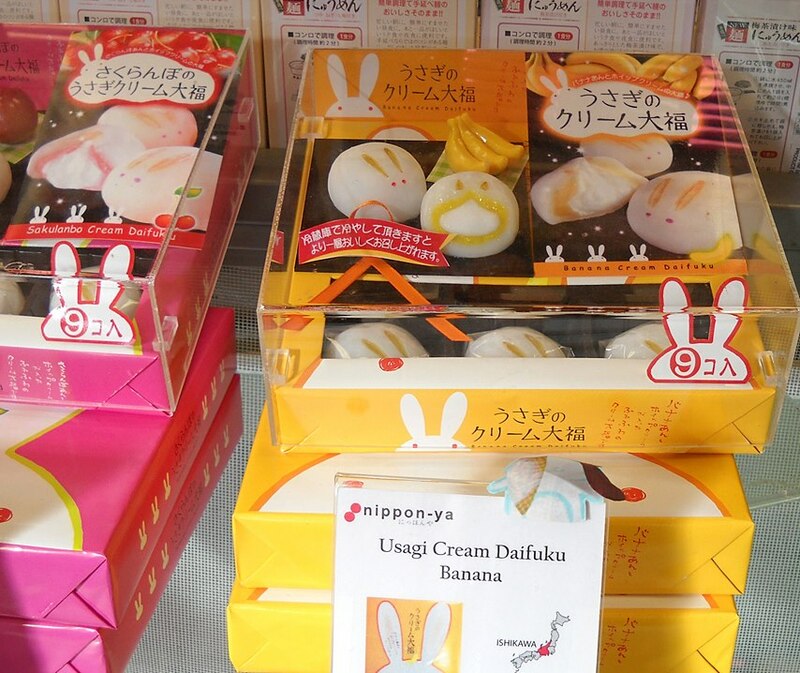 That being said, there are definitely more trivial Japanese food items in stores than expected, even in relatively isolated and rural places. Speaking of which, I am now living in a very remote place in Northern California. 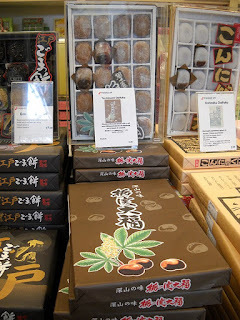 Few people have less access than me so, if I can find ways to buy Japanese treats from where I am and share them, almost anyone can have the foods I am reviewing. So, I am back for a bit, and I have a pile of things to review, though I'm not likely to ever review with the same frequency I once did so expect things to be sporadic. If you have an RSS reader (I use Feedly now that Google Reader has gone the way of the dodo), I'd suggest subscribing to get notifications of new posts without having to check back for new content. My hope is to got into a scheduled situation again at some point (maybe posting once a week on the same day), but I'm not sure yet how that will go. I have also re-enabled commenting on this blog and I'm leaving it wide open now, but if my stalkers decide that's an invitation to harrass me again (because they hate me, but can't help but hang on my every word), then I may have to narrow privileges. We'll see how it goes.